After reaching the softcap during the preliminary phase, during the public sale our project has already proved to be successful, selling AQU tokens till now for 2,75 million USD equivalent. 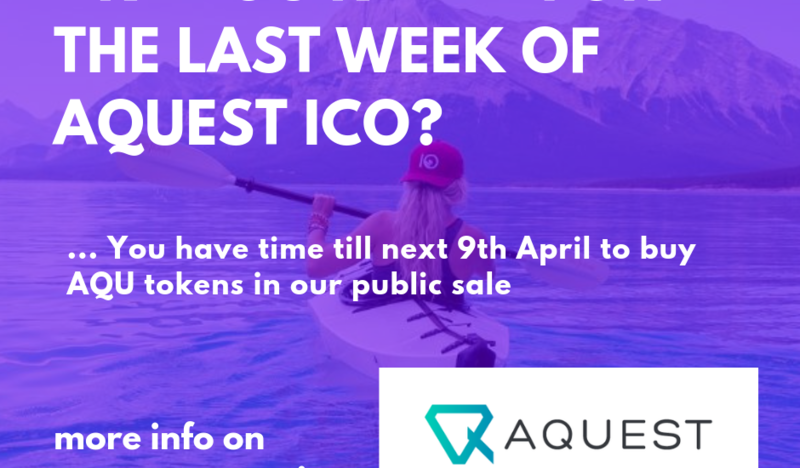 And next Tuesday 2nd April it will begin the last week of aQuest ICO. 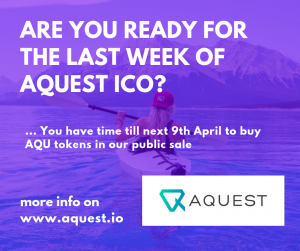 Everybody can buy AQU tokens directly from our web site from https://www.aquest.io/product/aqu-token-public-sale/. Fixed price of 1 AQU is 0.006 Ethereum (ETH). With aQuest you can create powerful marketing campaigns that focus on rewarding its participants. Participants are required to finish a simple task in order to be eligible for a secure reward payment. On the other hand you as a company can gather important data on your customers and boost your brand recognition. For example, if this quest is an airdrop quest, the signee can obtain valid ERC-20 tokens at the end of the airdrop. Last, but not least, all quests integrate with Enkronos Apps and contribute to building a creators Users Pool. Quests are a great way to help build up the users pool in Enkronos Apps while at the same time as your collection of users is building up you can engage the same users with other applications that focus on improving the engagement of users with your brand. You have time till next 9th April to buy AQU tokens in our public sale.